Lets get right to the point – this toy is AMAZING. It has exceeded my expectations in almost every way imaginable, and sets the new standard for modern gokin. 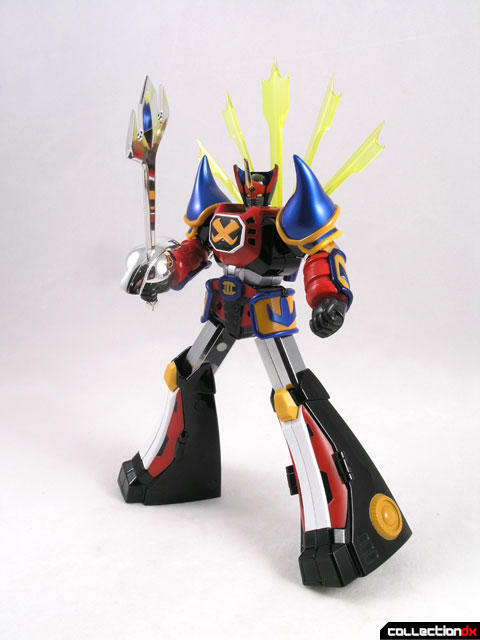 The CM’s Corporation Brave Gokin GoShogun is the 8th entry into their line of diecast robot toys. 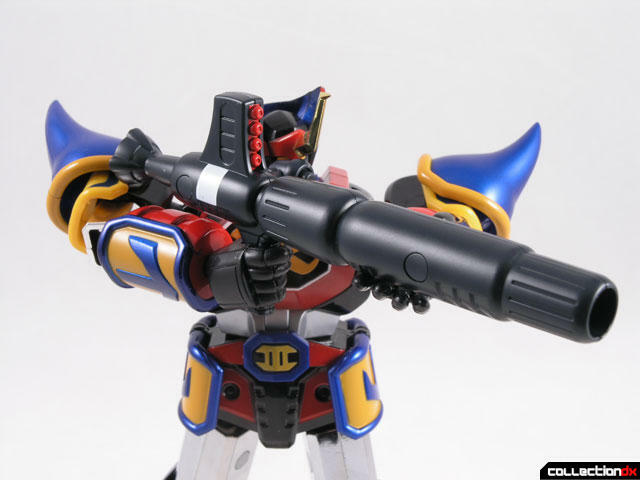 These high end toys give Bandai’s Soul of Chogokin line a run for their money. 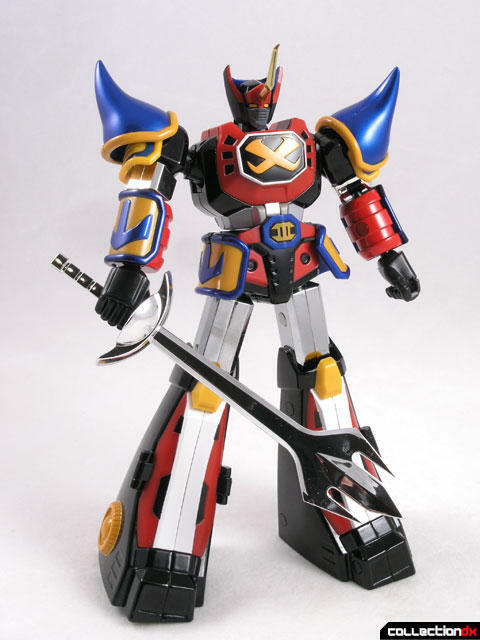 GoShogun comes from the 1981 Super Robot Anime Sengoku Majin GoShogun (戦国魔神ゴーショーグン). 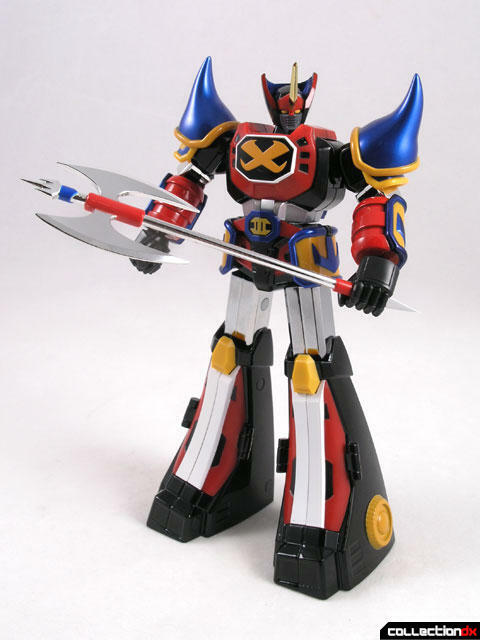 Fans in the US may recognize this robot from a show called Macron-1, an imported mash-up of GoShogun and Srungle. This toy is so incredible – it is hard for me to know where to even start. When the package arrived via EMS from HobbyLink Japan, I stopped everything and tore it open. GoShogun comes in a suprisingly small and light box. Inside the box you find a styrofoam tomb with a clear plastic tray attached to one side. The tray houses all of the accessories for GoShogun, and the styrofoam GoShogun on one side, and more accessories on the other. The figure comes assembled and ready to play – there is surprisingly little you have to do with it. 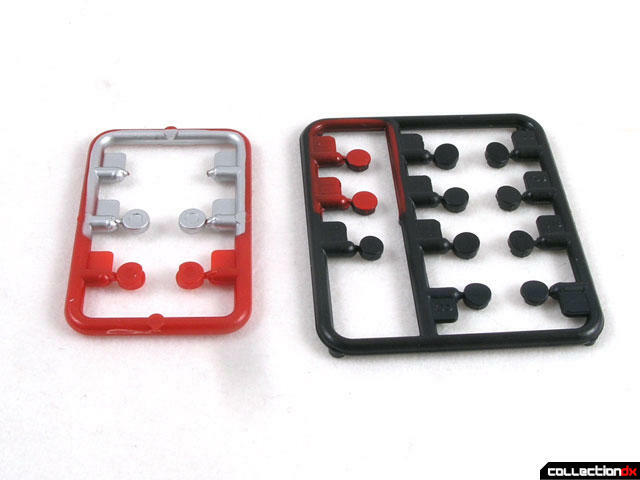 Included with the toy are some caps to cover up the screw holes. Make sure you read the instruction manual before you apply these – specific caps go in specific holes. The caps are also notched so they can only go in a certain ways, and they are angled to match the surface of the area. I can’t stress enough how important this is. One of the most surprising (and wonderful) things about this toy is the sheer amount of metal used in its construction. I’d say the toy is about 80% metal. It is one of the most satisfying toys to hold, and it actually feels like a “new” vintage toy. Also surprising is the amount of articulation packed into this toy. 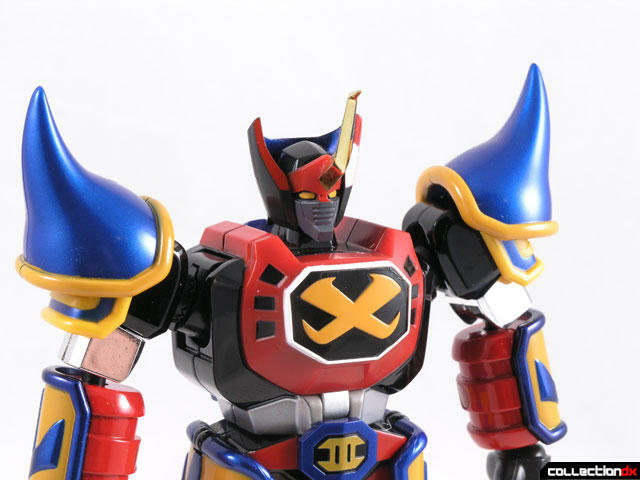 For example, the shoulders have very deep ratchets that make a satisfying click when moved, but then that whole assembly swings up and out, allowing the arms to be held up over the head. 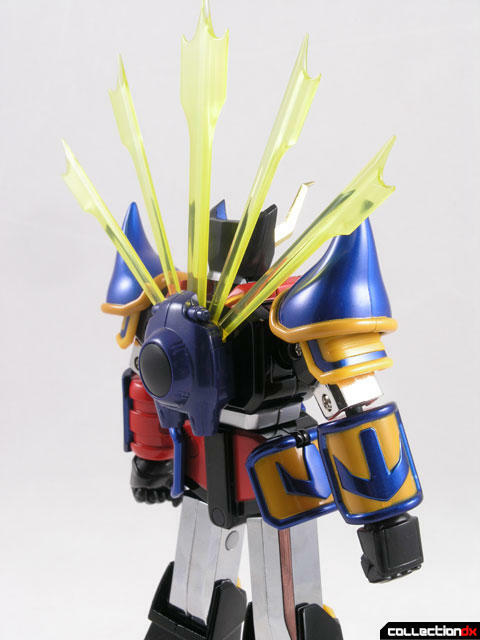 Each shoulder pad is movable, and the rest of the joints are exceptionally tight. The neck is a ball joint and there is actually a waist joint. The hips move in every way that you would imagine (they are basically just ball joints, but really tight). Probably the most luscious joint in the whole toy is the knee joints. They just swing forward and backward, but they have that metal-on-metal “klank” noise that just makes my heart skip a beat. As people have mentioned, there are no ankle joints, but it really doesn’t matter. I think ankles would get in the way of the aesthetics of this piece. Not only does GoShogun look and feel great, but it’s actually a fun toy as well. The translucent yellow “Go Flasher” assembly on the back is spring loaded and fires off with the push of a button. 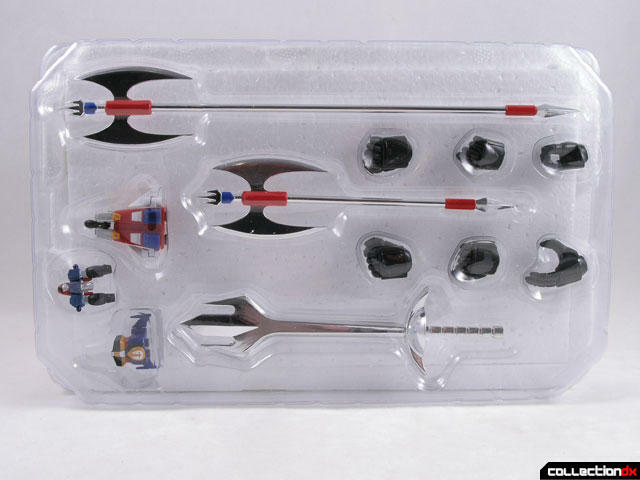 There are three hidden compartments on the toy which house microscopic space ships (King Arrow, Jack Knight, and Queen Rose) that can actually combine into a robot called TriThree. This robot is smaller than a AA battery and still has articulation! To top it all off, each of the three ships can be mounted to a display base that looks like the exhaust trails of the jets! 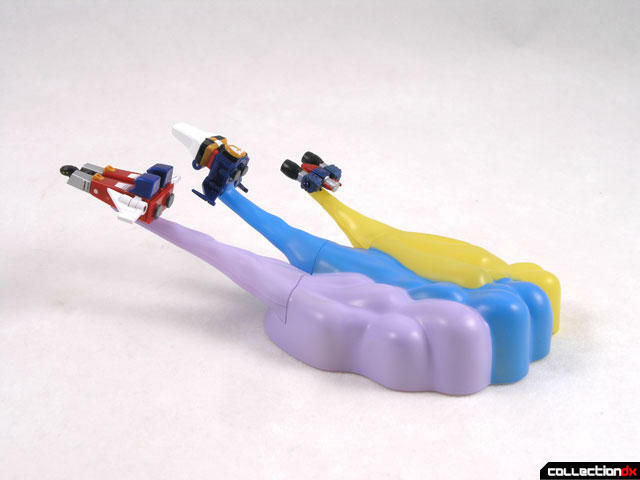 Of course the figure comes with a variety of different hands to hold all of the different weapons. There are different hands for holding the sword, axe or bazooka, as well as closed and open hands. My one concern about the hands is that they are made of a really pliable rubber. Think of the consistency of a superball, and you have an idea of what these are made of. I really hope these fists will last the test of time, but I somehow doubt it. It is likely that they will eventually dry out and crumble, but that time is a long way away. This toy is the best new toy that I have gotten so far this year, and something would have to be pretty amazing to take its place. 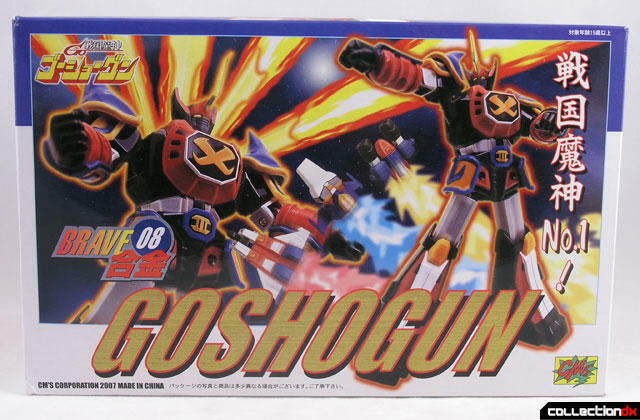 GoShogun has “Toy of the Year” written all over it. GoShogun is available at HobbyLink Japan. Get it now. Awesome review and pics Josh. Now you're making me want one. 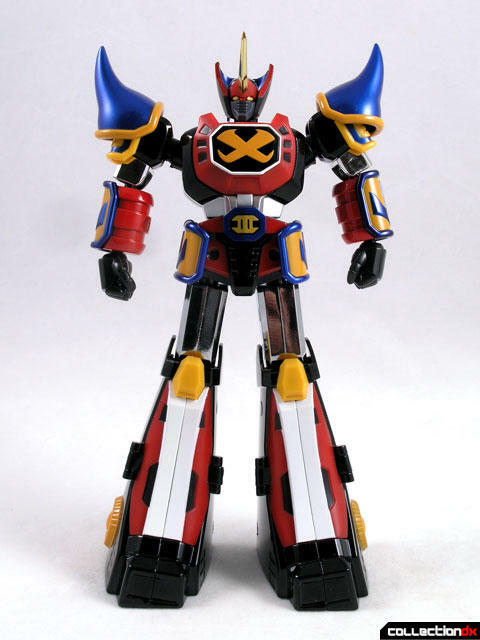 I hope that CMs continues to release robots that are untouched by Bandai. I have high expectations with their upcoming Legioss and Tread set. BTW, is there any diecast part on the three ships? There is no diecast in the small ships. If CM's can keep the legioss and tlead simple, they will be great. I am becoming increasingly weary of overcomplicated toys. 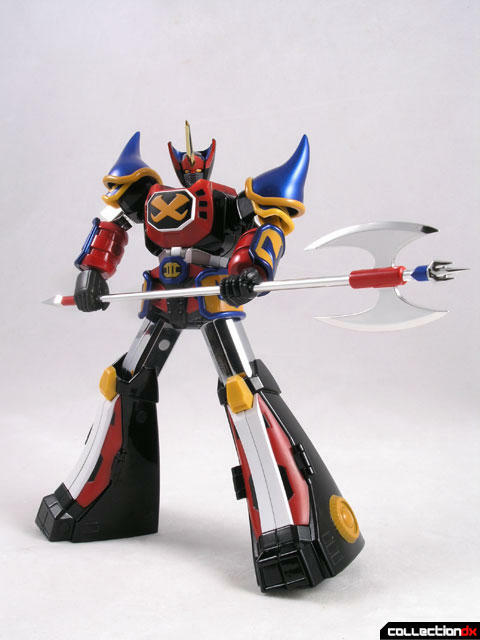 May have to get over my modern gokin phobia and pick this sucker up. Seriously, though...does it really shoot well? Eye-gougingly well??? Reading the review and checking out other collectors' pics, I kept thinking to myself that if this thing had a shooty gimmick, it'd be pretty much perfect. It shoots really nice. I had thought i recorded it, but i had the camera on pause instead of record, so you missed out on me showing the diecast content, and the shooting mechanism. I can bring him to lunch if you like. This is a pretty old review, but I wanted to comment nonetheless, even with the lack of faith that someone will read this. Maybe I'm just bored. I got this piece a few days ago, and Josh is right about how amazing it is. 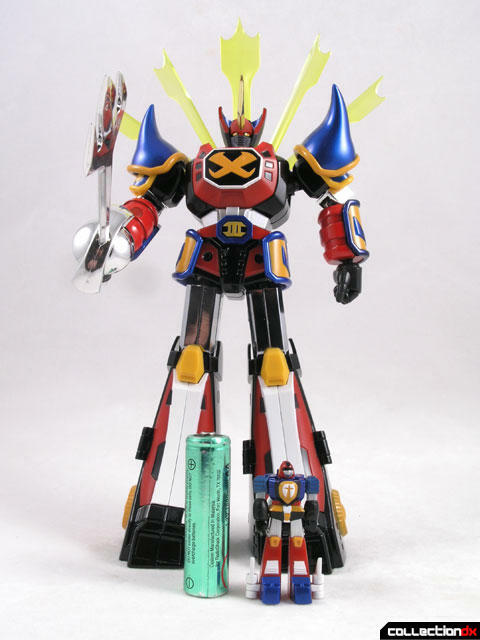 I don't even have the well-tested standards of a real gokin collector, and I love this thing. It really is 80%+ metal. The articulation of the upper body is to die for, but the legs are only slightly behind what I expected. This is, of course, because I am a noob who doesn't know WHAT to expect. The fit of the mostly-red ship on the stand is a bit tighter on my set, but mine comes with an unfortunately loose hip, and minor defects on the finishes of the weapons. Also, I am still looking for a screwhole cover that I lost during installation; the one for the left toe part of the foot. All the others are in, and if I don't find it, it's going to bug the hell out of me (just like the missing sword connector of the Baikanfu set). Overall, I am very pleased for what I paid ($101.70 shipped). Thank you for selling me on this figure with this great review, Josh! I just received this guy today and I gotta say I love it. I was a little disappointed that my "Brand new" Goshogun had been previously opened and the antenna was broken but thats another story... This guy is heavy and he feels good in your hands without feeling too delicate. This guy feels like it was meant to play with. I dont feel like im gonna break it like when I hold some of my SOCs. Its my first CM's kit but if this is any indication of the quality of their stuff, I'm hooked. He displays well but I find I pick it up to enjoy its heft more than the time it spends being displayed. I bought it after reading this review and the review is dead on with its awesomeness. Highly recomended and its going for about $100 bux. 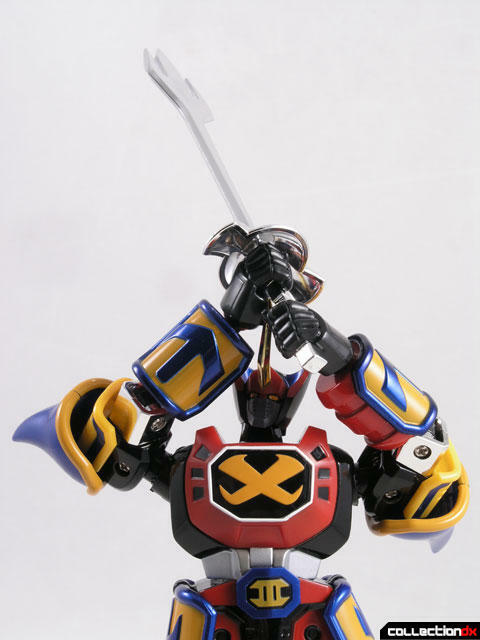 If you liked CM's Goshogun check out CM's Sankan-Oh or CM's Gyakuten-Oh. Both figures are awesome and full of die-cast goodness! The Sankan-Oh can be grabbed on Ebay at a steal for just under $100 bucks. Get either, you wont be disappointed. 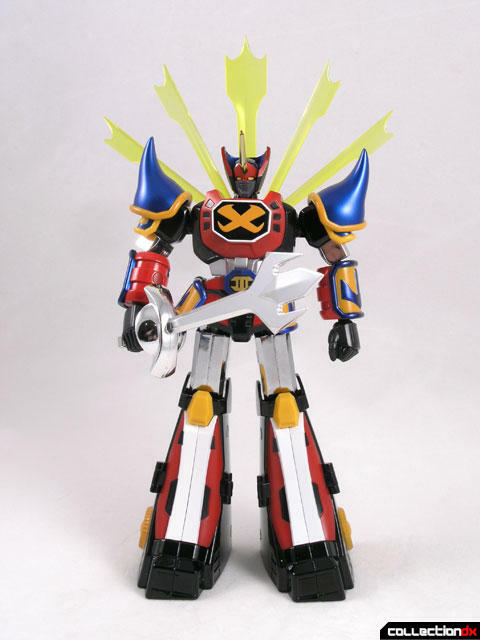 Yeah I got my sights set on Sankan Oh right now and Groizer-X.. I love diecast robots. 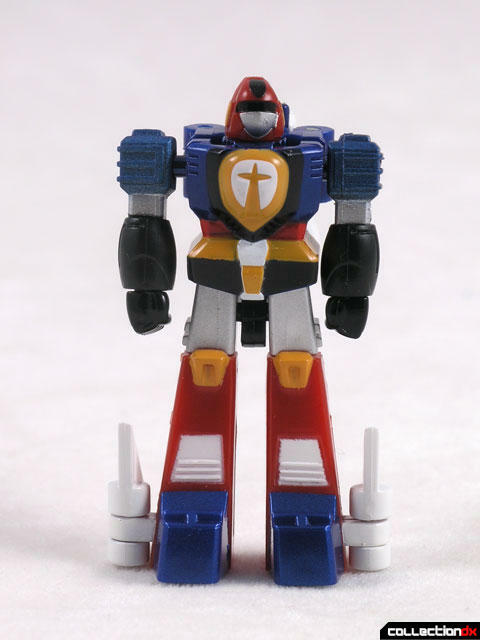 I grew up in Queens and my mom would always buy me robots from the chinese stores next to her work and they always sold diecast robots real cheap, I remember seeing huge Popy boxes on the walls and thinking that Golion was a fake version of Voltron haha cause thats what he was known as. My Grandma got me a "fake" yellow lion and now I know it was an original and it is still in great shape. Great News. HLJ is selling it around $60-ish.